Man, is it summer. While I am still trapped inside the house, it is still H O T. We don't have air conditioner downstairs, where I spend most of my time (circling back and forth from the kitchen, to living room to watch tv and crochet, to the dining room for the computer) sitting in front of various fans and eating as many popsicles as possible. And since I'm barely cooking, I spend a lot of time thinking about what I want to eat. I found this recipe in this months Gourmet. I can sit at the table and do prep work, but not stand at the stove and cook, so I did most of the work while Alex fried. Cut the jalapenos from the stem to the tip on one side, and then cut a cross right below the stem, forming a T. Hopefully you have some rubber gloves (if not make sure you don't rub your eyes or pick your nose for a while), and you can reach in and scrape everything out. I tried this with a knife and it didn't work as well and took 3 times as long. Repeat with all the peppers. 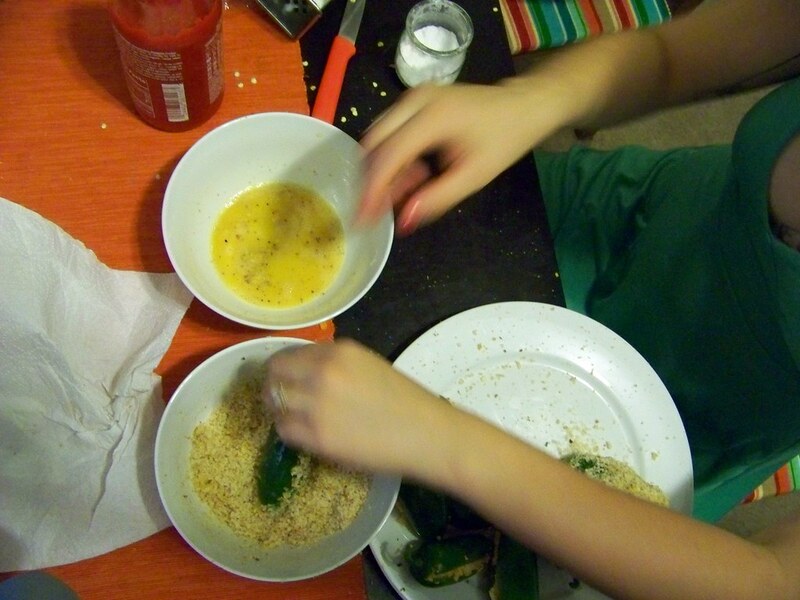 Mix the cheese with the hot sauce, and a good pinch of salt and sprinkle of pepper. Stuff each pepper with the cheese mix, packing it tight. 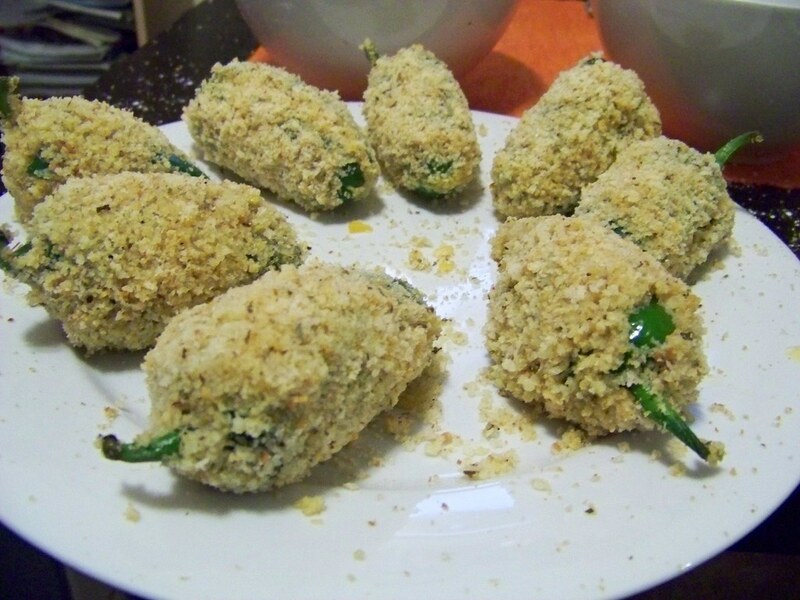 Dredge each pepper in rice flour, then egg, then crumbs. Careful, because the crumbs won't want to stick. Place aside, gently, and repeat. The Gourmet recipe said to double dip them in the egg and crumbs, but that didn't work with my crumbs, it just made everything slide off into the egg wash.
Gently fry the peppers in batches of 2 or 3 in hot oil, drain on a paper towel, and serve immediately. 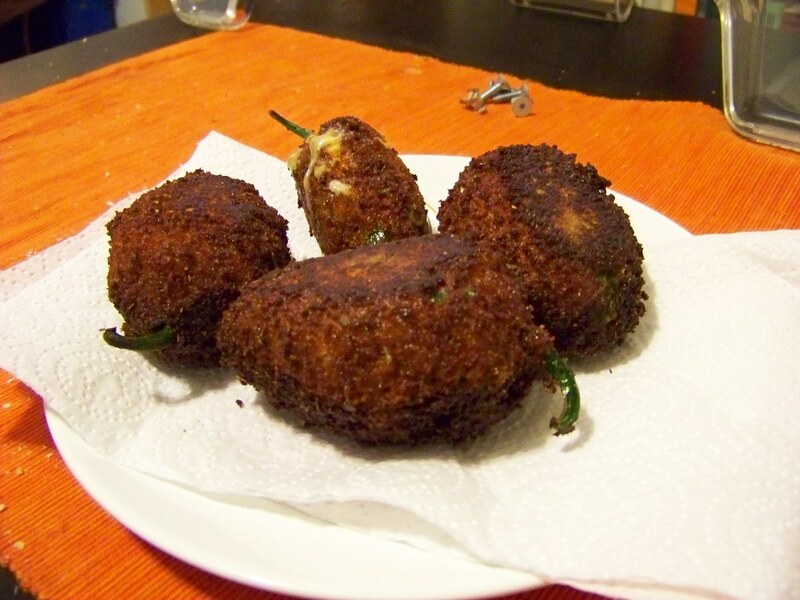 If your fiance refuses to eat them, they can be stored in the fridge and reheated in the toaster oven for a few minutes at 350.
look great i love poppers i will try these and let you know how i found them, again thank you for the post.